Update 5/11/15: Received email that the captions incorrectly identified the attending policeman. It was Office Palmer, not Officer Kelleher. Article and captions corrected! Turtle health update at the end of article. On Monday, May 4th, I witnessed the tail end of a rescue from a drainpipe at Rosemary Lake. A resident had reported that a turtle was stuck in a pipe on the side of the lake. 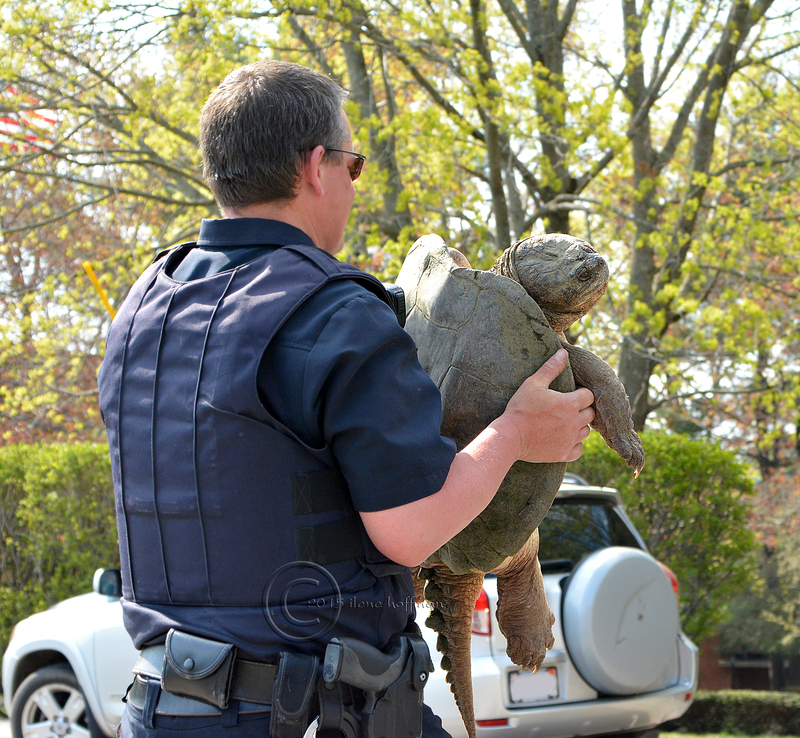 Due to the annual lake draining and the turtle posing as a plug, the Needham Public Works Department was alerted along with the local police and animal control. When I got there, the 45-pound Common Snapping Turtle had been extricated from the pipe by Police Office Palmer and three DPW workers. Animal Control Officer Danielle Landry told me it had been there at least 24 hours, but she couldn’t ascertain its condition. While they thought the turtle was still breathing, no one could be certain, until it moved ever so slightly. 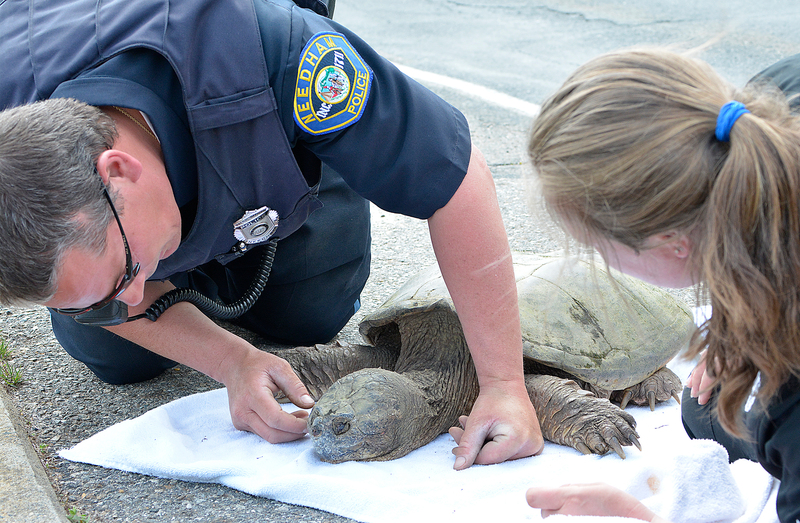 Officer Palmer, with limited past experience with turtles, did his best to assess the creature’s condition and made sure it had no obvious wounds. Note to Readers: Please click on the photos to see a larger version and please click the link in the last paragraph to help support the medical care for this rescued reptile! On his way home, a good neighbor stopped to help and provided the town staff with a ladder to aid in the rescue. 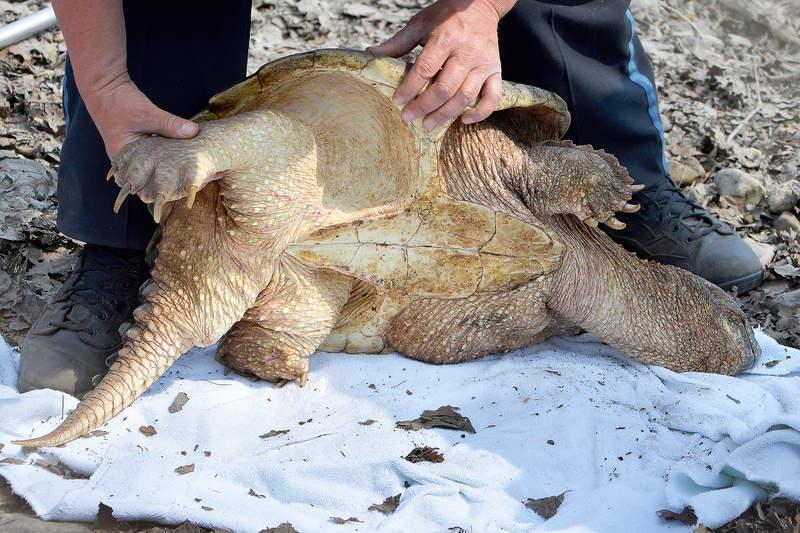 Kiko Bracker and his daughter Story also conveyed the massive snapping turtle to the hospital. (A short video, presumably taken by Story Bracker, appears in the Gallery on the donation site, linked below.) Bracker isn’t just your typical nice guy, he also happens to be the Co-Director of Emergency & Critical Care at the Angell Animal Medical Center in Boston. Alas, turtles are not his specialty, so he could not determine the turtle’s condition either. 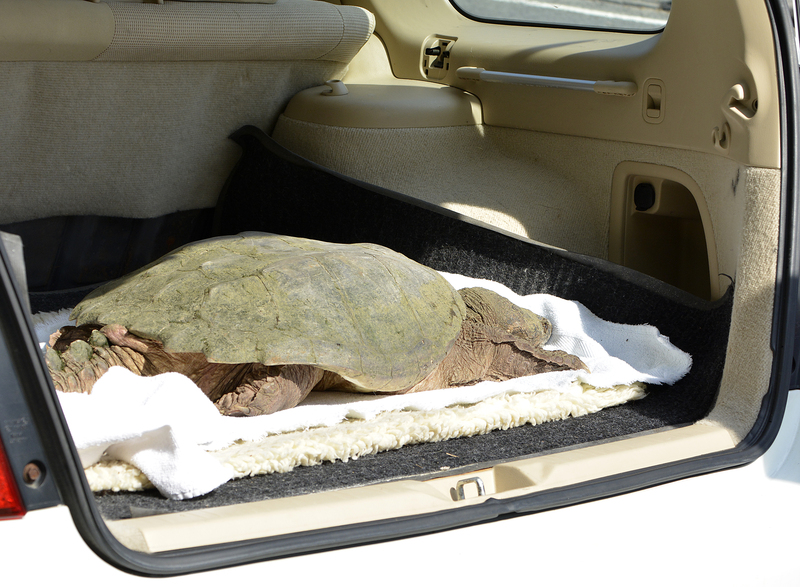 After wrestling the turtle through the fence around the lake, Officer Palmer and Dr. Bracker moved the weighty Snapping Turtle to Bracker’s car trunk. Bracker insisted he personally transport the ailing animal to the hospital to be seen by wildlife specialists at the Tufts Wildlife Clinic in North Grafton, MA. Later that night, after the trip to the hospital, Dr. Bracker said that the turtle was alive, but had a slow heart rate and that the Tufts Wildlife Clinic would keep it overnight for observation and treatment. 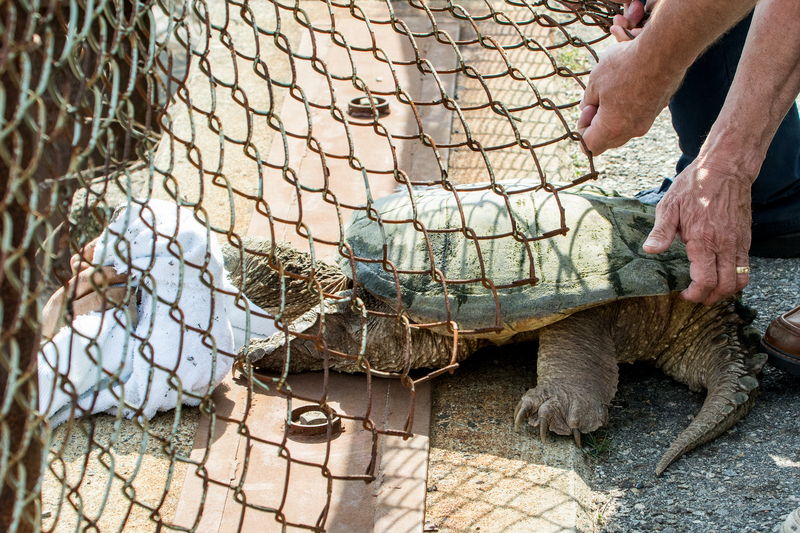 The Snapping Turtle’s condition was listed as “guarded” and they are doing their best to save its life. It was put on a ventilator overnight, but was breathing on its own when I called Tuesday afternoon. If it survives it will be brought back to Rosemary Lake. 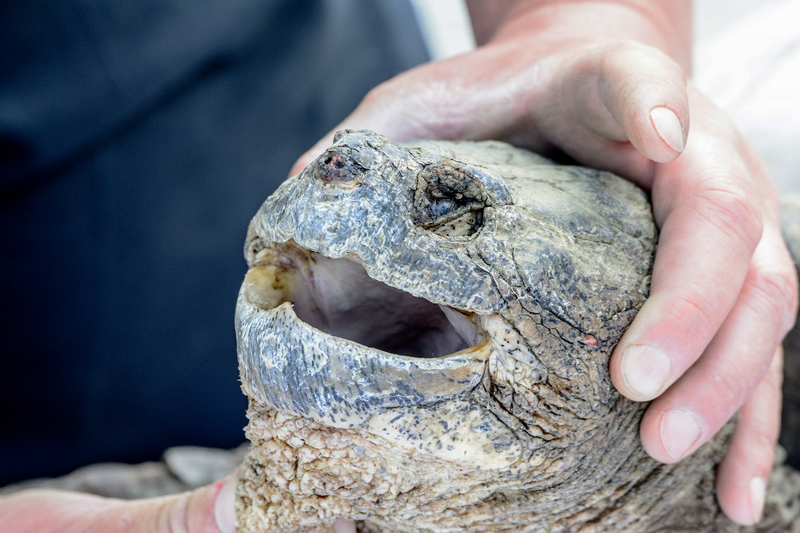 As of late Wednesday, Dr. Bracker wrote that “He is doing much better and is predicted to live!” The turtle is “decades old” said Dr. Bracker and is probably much older than its weight the Tufts staff estimates it is at least 70 years old. (Common Snapping Turtles can live up to 100 years.) There are a few large snapping turtles in Rosemary Lake, which I saw in the drained lake on Tuesday and Wednesday. Under normal circumstances, one should never approach or handle these reptiles, because they move surprisingly fast and can deliver a limb severing bite. 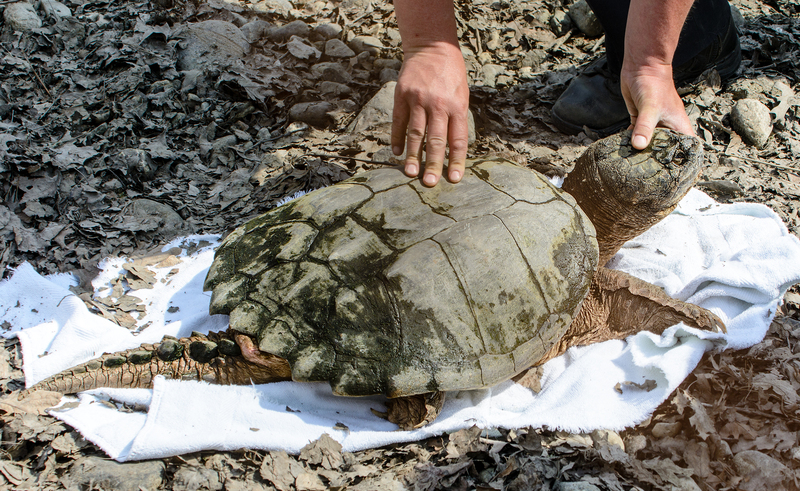 If you could see to help with our aged not so-Common Snapping Turtle’s treatment costs, please donate any amount you can afford. 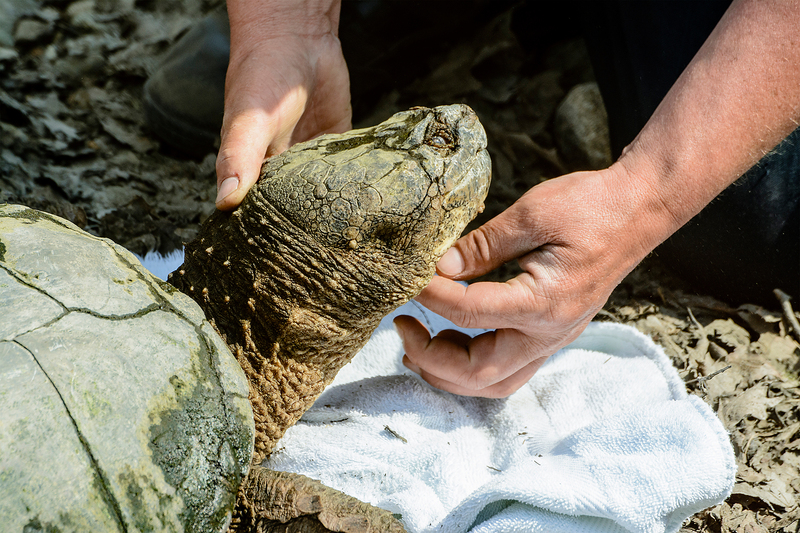 Please make donations on a special page set up by Dr. Kiko and Story Bracker with Kara Holmquist, MSPCA Director of Advocacy, on the YouCaring site: Help cover the Needham Snapping Turtle’s veterinary care! 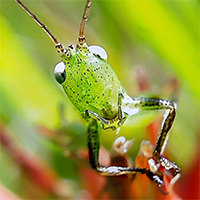 You can also donate online through the wildlife fund on the Tufts University web site. Go to the Tuft University’s Give Now site and choose Cummings Veterinary School and when “Select an Area” appears, choose the Wildlife Program. You can dedicate your gift to Needham’s turtle or make it a Mother’s Day gift! The Needham staff and the Brackers deserve much credit and a generous thank you for the gentle care and handling of this delicate wildlife emergency. Donations received are about 1/4 of the amount needed, so please help, if you can afford it! Should We Give this Male Common Snapping Turtle a Name? If yes, please make a suggestion in the comments. Dr. Bracker noted on the donation site that the highest donor will get to name the turtle! 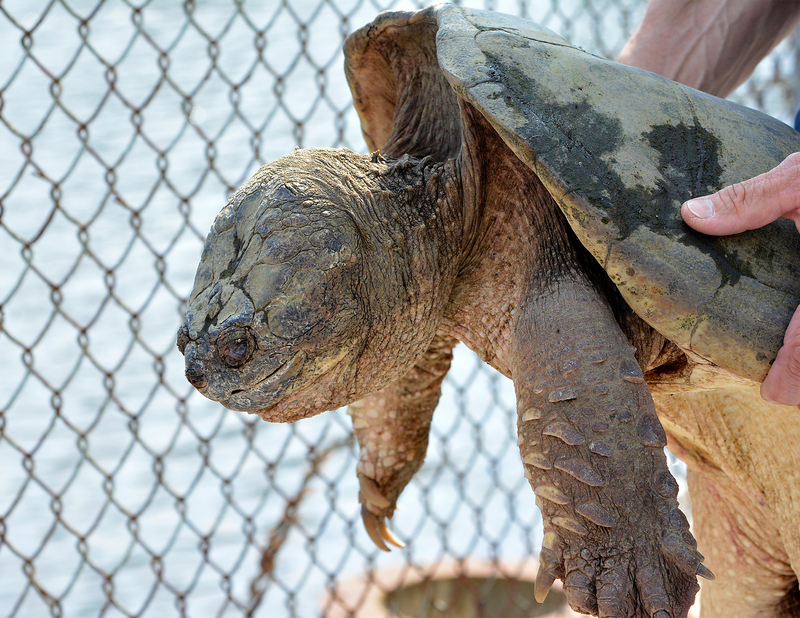 This entry was posted in Commentary, News and tagged Common Snapping Turtle, Mother's Day, MSPCA, nature, Needham, Rosemary Lake, Tufts Wildlife Clinic, Turtles, wildlife rescue. Bookmark the permalink. Billy McGaffican and I swam 50 miles in Rosemary Lake when we were probably 13. We finished in the top five of swimmers doing the 50 mile swim that year. Worked at it 300 yards at a time out near the wooden log barrier. The other three were lifeguards on college swim teams who would fly through laps during the hourly 15 minute rest periods. It was a real trip. We made it without losing any limbs or appendages. With that special Rosemary Lake taste in our mouths from sucking down the air escaping from the rubber factory back then. So I have a lot of sympathy and empathy for Rosemary life forms. Swam for the swim team there a lot of years. Allen, Paul, Nancy, Lenore and I were hanging tight summer 1965 churning up butterfly wakes and backstroke euphorias during daily morning training and evening meets. For Billy and me a couple of years earlier that long swim was capped by the opportunity to compete in a 1.5 mile race with about 50 other competitors, 5 each from towns all around in the same swim team league. That was in the pretty blue water lake Sherborn’s FARM POND. Billy and I were by far the youngest in that race. We did push it and buddy swam the whole way, busting our asses off against each other the last couple hundred yards. He beat me. By about a yard, or a touch as I would like to say. But we did respectably, finishing somewhere in the middle of the pack. Like the Charles … I love that __ water. Don’t know why everyone’s saying Boris, but I love that name! Let’s name it Boris! Boris was our turtle! We were heartbroken when we lost him. And yes, it’s possible to lose a turtle. Good you are doing! I like the name Boris , it definitely suits a snapper. Boris may have had something to do with the demise of my dear pet Goose who met her end on the banks of Rosemary Lake many moons ago. And her distant cousin, in a lonely, vengeful fit, befouled the Rosemary Lake swimming pool …….repeatedly. Great blog Ilene and lovely story! Boris was the name of my niece and nephew’s tortoise that was lost in Needham years ago. Please name this one Boris. There was a turtle in needham some years ago that got lost & was never found. dont remember who owned it, but i do remember it’s name was Boris. That would be an awesome name! Please name this turtle Boris in honor of the turtle my dear friend Danny lost many years ago in Needham. It would bring us all closure to know that Boris the turtle is still out there. Perhaps, and I hope, that this is the very same turtle. it is my personal belief that this turtle should be named Boris. My dear friend Danny lived in Needham as a child and had a turtle named Boris that escaped one day, and it is my hope that this turtle who has been rescued is that selfsame turtle as the one Danny lost lo these many years ago. Please name this turtle Boris.